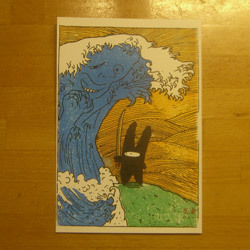 Ninja bunny battles the monsterous wave, The original image was from the 300th comic strip. 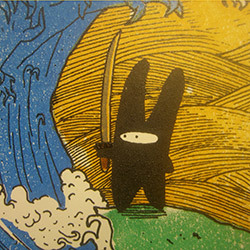 This is a 7 colour Japanese Gocco screen printed postcard. A limited edition of 40 which are signed and numbered on the back. 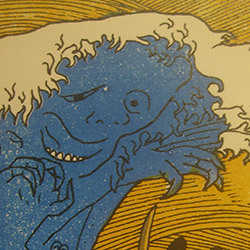 Due to the nature of the Gocco printing method small imperfections with the ink and print alignment appear, this is all part of the charm that makes each one unique. Your item will vary slightly from that pictured.